I DD a 2012 Ford Focus SE, and Ford sent out a recall last year for door latches that would fail to latch. I ignored it until recently, when my Focus’ driver’s door wouldn’t stay closed because of a broken latch. We ended up scheduling an appointment with a local Ford dealer to get the car fixed. My dad drove; I was in the passenger seat, holding the driver’s door in place by tugging on an Ethernet cable that my dad had tied around the driver’s door grab handle. I’m annoyed that I had to go without the car for about a week, but it’s my own fault for not addressing the recall for so long. On the plus side, I also took the opportunity to get the instrument panel cluster updated! Early units of the current-gen Focus don’t have the quadrant display that the later ones do, and there’s a TSB that directs dealers to flash the latest IPC software if a customer complains about the IPC not turning on at startup. I fibbed about the IPC not turning on sometimes (it was perfectly functional), and they reflashed the IPC while doing some other maintenance work. As you can see in the lede pic, I have the quadrant display now! It’s nice to have all four trip readouts displayed at the same time. There are a few other changes, too. The turn signal has a softer sound now; my dad used to complain about the original sound, though I think I prefer the old one to the new one. 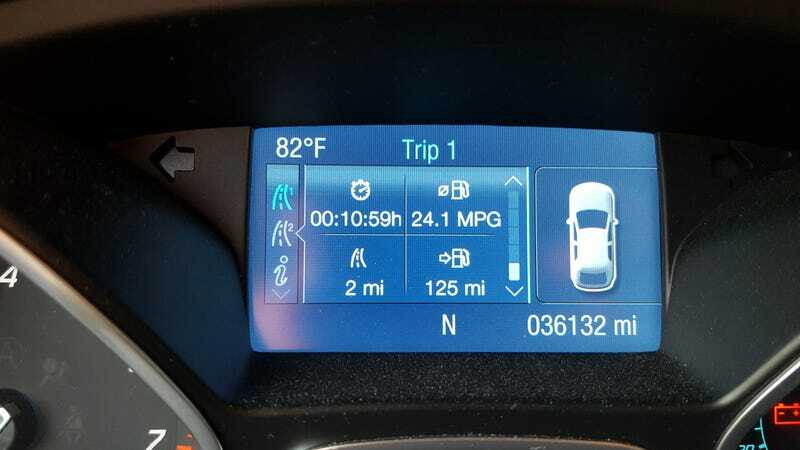 The average fuel economy readout’s EcoMode screen rates how well you do on certain tasks involved with economical driving; it used to have Gear Shifting misspelled as “Gear Shifiting,” but that typo has been fixed. It seems that there are some new warnings, as well; the car now alerts me if the engine is on when I open the door.